The indulgences in this generous gift are enough to send anyone into a state of bliss, with luscious chocolate truffles, cookies and Kopper Chocolates' Cherries Jubilee - a decadent mix of dark chocolate-covered cherries and almonds. Meltaway Chocolate Truffle Box, Black & White Cookies. Chocolate Chunk Cookies, Chocolate Cherries Mix. Droga Chocolates, French Galettes and much more. Your gift will leave a lasting impression as they continue to enjoy this elegant keepsake serving tray with contrasting leather trim. One (1) initial can be engraved on the ornament surface. Enter information to be engraved during the checkout phase of the ordering process. 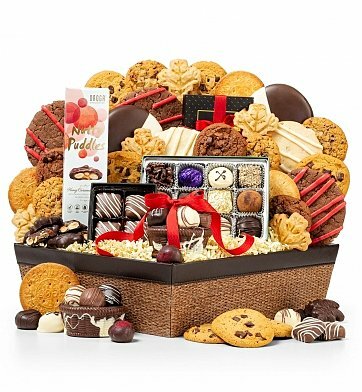 Chocolate Bliss Gift Basket is a hand delivered gift. These gifts are delivered by one of our local design centers located throughout the United States and Canada. Same day delivery is available for most gifts when ordered before the cutoff time. The cutoff time for Chocolate Bliss Gift Basket is 2 PM in the recipient's time zone. Chocolate Basket of TrufflesTied with a red ribbon, this basket of decadent chocolate truffles holds a surprise - the basket itself is solid milk chocolate, too. Peppermint Meltaway TrufflesTastes like the name implies - smooth, creamy melt-in-your-mouth chocolate infused with a hint of peppermint flavor. These rich, velvety mint chocolates are made with pure oil of peppermint and covered with premium couverture milk chocolate then topped with a white chocolate drizzle. Twelve Piece Chocolate Truffle TrayEnjoy a variety of chocolate ganache truffle centers enrobed in premium blends of milk, white, and dark chocolate. Each chocolate truffle is handmade with only the best quality ingredients. Premium chocolate couverture, pure milk and real butter are used along with gourmet additions such as fine liqueurs, fruit extracts and nuts. Chocolate truffles, two dozen cookies and so much more. Arrives presentation-ready in a basket with attached note card.